In the past, many people started their own businesses because there were no other opportunities available to them. Mom & Pop entrepreneurship was thriving. However, in today’s world the notion of being an entrepreneur is changing, especially amongst younger generations, where becoming an entrepreneur is as aspirational as it is a necessity. Beyond the shifting mindset, a number of trends are coming together to make realizing the entrepreneurial dream easier, faster and cheaper. These include technology advances that allow entrepreneurs not just to start fast and often virtually, but to develop innovative business models. The number of funding platforms and hubs for entrepreneurial activity has also exploded, allowing budding entrepreneurs to access capital, resources and knowledge, as well as to test their ideas with experts and peers. New businesses can be a huge driver for innovation and change around the world. Let’s have a look at some of the new business models that are redefining the entrepreneurial world. Traditionally, social entrepreneurship has been viewed as being purely about altruism while in reality it is also about capitalism. For the new generation of social entrepreneurs the traditional distinctions between non-profit and for-profit are breaking down. They have realized the two sectors can learn and benefit from each other through partnerships as well as investor relationships. And the idea of being able to do social good and run a profitable business at the same time is increasingly socially acceptable – and demonstrable. One example is Two Degrees where, for every nutrition bar it sells, the company donates a package of vitamin- and nutrient-enriched peanut butter to a malnourished child in Malawi. Another example is VisionSpring that has successfully sold more than 2 million affordable eyeglasses to poor people in developing countries. A new and increasingly popular business model is sharing. Today, thousands of new entrepreneurs are renting or selling access to products and services, rather than selling them outright – building businesses that allow individuals to benefit from an exploding number of choices to meet their needs. Among some of the leading sharing economy platforms you will find: Airbnb (accommodation), Lyft (ridesharing), Park at my house (people renting out parking spaces), TaskRabbit (outsourcing of errands and tasks), DogVacay (board your dog in a real home), EatWith (authentic dining experiences in which people pay to dine in private homes), Rent the Runway (rents high-end designer apparel and accessories), Uber (connects passengers with drivers of vehicles for hire), and Chegg (specializes in online textbook rentals in both physical and digital formats, homework help, and scholarships through Zinch). While the majority of startups are funded mainly through personal savings and credit, and friends and family, new sources of funding are making the quest to start up a new business or project easier and quicker. All over the world entrepreneurs have watched successful startups such as PayPal, Skype and Facebook succeed – but where do these aspiring entrepreneurs go to realize their big business dreams? Google for Entrepreneurs is one place. Since 2011, it has brought together startup communities and created spaces for entrepreneurs to learn and work in 125 countries. In Nairobi, Kenyan startup accelerator NaiLab supports several startups on-site and more virtually. In Charlotte, U.S., Packard Place is a hotspot for entrepreneurship built for entrepreneurs by entrepreneurs. It provides co-share space for startups and high growth companies. In Toronto, Canadian accelerator Communitech, also founded by entrepreneurs, has helped more than 1,000 firms, while generating more than $30 billion in revenue. The potential for entrepreneurs to contribute to social and economic development globally is huge – building our future and growing economies by launching the next generation of innovative companies. However, the entrepreneurial marketplace is highly competitive and the success rate for the hopeful varies. Many young entrepreneurs have little or no experience and in the HBR blog “Entrepreneurs Get Better with Age,” it is noted that: “Twice as many successful entrepreneurs are over 50 as under 25. The vast majority – 75% – have more than six years of industry experience, and half more have more than 10 years when they create their start up.” For the next generation of motivated and eager young entrepreneurs, education is a necessity for success. The idea of teaching entrepreneurship is far from new, but has only really come of age in the past decade or so. A helping hand from big brother…: The role of education is changing in society. No longer is it expected that education is the sole responsibility of educational institutions. In a world of constant change, large and well-established companies also have a strong interest in nurturing a culture of innovation and entrepreneurship in the business environment, as they will need to access these capabilities – and perhaps the new ideas too – to thrive in the future. 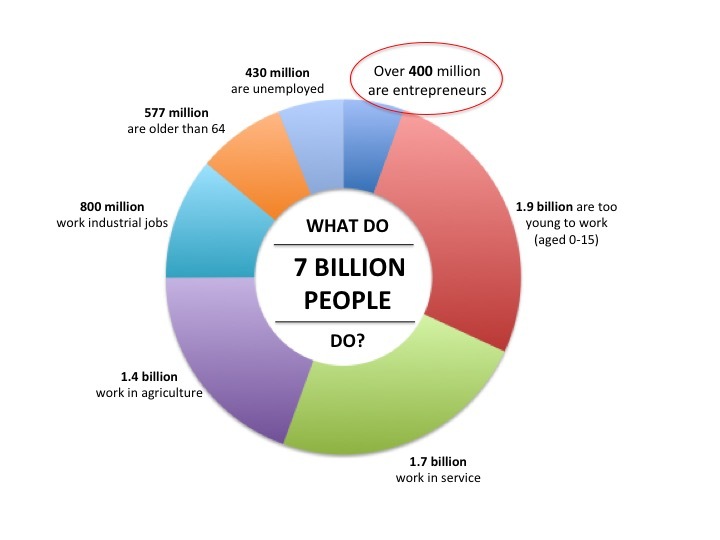 Around the world large corporations are therefore investing heavily in entrepreneurship education. One example is Cisco’s Entrepreneur Institute which works with institutions and governments globally to foster growth and innovation in information and communications technologies. Another is Intel that, since 2005, has invested in a number of initiatives aimed at inspiring and providing education and critical skills for young entrepreneurs, e.g. Ideation workshops, Entrepreneurship Basics (self-paced e-learning course), and the Intel Global Challenge at UC Berkeley. Launched in 2008 Goldman Sachs’10,000 Small Businesses is designed to help entrepreneurs by providing them with greater access to education, financial capital, and business support services. …and from the public sector: Governments around the world have also understood the importance of education to foster successful entrepreneurship. In Ireland the government-funded development agency Enterprise Ireland is helping to create new businesses and jobs, as well as to develop the potential of existing businesses through innovative programs. To help foster local innovation the non-profit incubator Startup Lisbon was established in 2011 by the Portuguese government to provide both infrastructure and services to entrepreneurial efforts. Transforming the educational system: In 2010, the Youth Pulse study by the Kauffman Foundation revealed that40% of 8-24 year olds in the U.S. want to start a business someday, or have already done so. These findings underpin the need for entrepreneurship education at all stages of the educational system. In Europe, they promote a strategy to establish entrepreneurial education throughout the educational system, with a natural progression from pre-school education to business. In 2013, 143,855 teachers and 154,091 business volunteers worked with the organization JA-YE Europe to reach 565,672 primary students, 706,950 middle grades and 1,976,221 secondary and graduate students. Building networks and ecosystems: The lone entrepreneur is increasingly a myth. Innovation labs, incubators, makerspaces, accelerators and hackathons are becoming increasingly popular catalysts for sparking ideas and start to build the network of support needed to launch a business or idea. Another, relatively new way is Startup Festivals: An International Startup Festival has taken place in Montreal, Canada since 2011 with more than 2,000 founders, investors, and analysts from more than a dozen countries. In India, the Construkt Startup Festival has more than 3000+ attendee and 150+ speakers and curated makerspaces. These festivals offer a unique chance to network, learn, share, create and celebrate the spirit of entrepreneurship. Or why not launch a “Startup in 54 hours:” Startup Weekend is another example of ways to build networks, tapping into knowledge and resources to move from idea to prototype. Here entrepreneurs can learn the basics of founding a startup, pitching ideas, forming teams, and starting companies. All startup weekends follow the same basic model, with events in more than 100 countries and 600 cities around the world. As we said earlier, in the future entrepreneurship will not be restricted to new players – large companies are also actively pursuing the capabilities and ways of working that make their smaller brethren faster, more flexible, and more innovative. In some cases, they are pursuing internal initiatives such as incubators and venture funding. In others, they are seeking to partner with more nimble startups to take advantage of the strengths of both parties: The speed and innovation of entrepreneurial ventures and the resources, knowledge and reach of the bigger partners. Replacing the traditional worker: The nature of work is changing; so too is the labor pool. New generations equals new expectations, and don’t forget to add to that the influence of globalization, social change and growing employee diversity. Against this backdrop, companies are increasingly replacing the traditional employee with a more flexible type – the self-employed worker. In “Workforce 2020 – The Looming Talent Crisis,” Oxford Economics reveals that 41% of the companies surveyed are using a growing number of contingent employees (independent contractors, part-timers, temporary, leased employees), 35% are increasing their use of intermittent or seasonal employees, and 34% are increasing their use of consultant employees. Expect continued growth in flexible alternatives to the traditional employer/employee relationship.